Everyone loves a great family photo, right? And the trend in recent years has been to blow up the best of your photos and turn them into stretched canvas artwork in your house. But doing this isn’t always cheap. I’ve seen stretched canvas photo art priced as high as $1000! Love that places like Staples offer an affordable and great quality option! 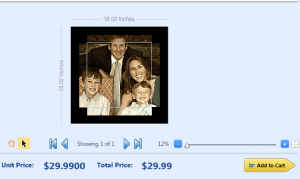 I can’t see why anyone would spend more money these days when you can utilize the Staples EasyCanvas tool online to upload your photo and print up a beautiful print for as little as $29.99! It’s $29.99 for an 11×14 or 12×12 and if you want to go bigger, 16×20 is also available for $39.99! You can do it all online. You’ll have to get yourself a Staples Copy & Print username and password. I already had one so it was literally as easy as the click of a button. There was free delivery with the order. Now I actually ended up saving it to my account because I had a coupon to get it in-store. Which leads me to that – you can do this all in-store if you don’t want to deal with ordering it online or waiting for a delivery time! The lovely folks at the Staples Copy Center can help lay this out for you and get it all ordered and the prices are the same in-store. You can also get photo enlargements done in store! This is such a great idea for a holiday gift and the price is just right for an impressive and affordable holiday gift! Visit the Staples EasyCanvas page to order today!